This week in the 52 Ancestors in 52 Weeks challenge I’m suppose to write about my favorite photograph. How does one pick one favorite??? It shouldn’t be a surprise to anyone that at the top of my list is this photograph of the Pacheco men. It adorns my website, my blog, and has its own frame on my bookshelf. The photograph was sent to me by my Mom’s cousin, Ted. It is one of those old photographs mounted on cardboard. We had very few early photographs, so I was happy when this came into my hands. 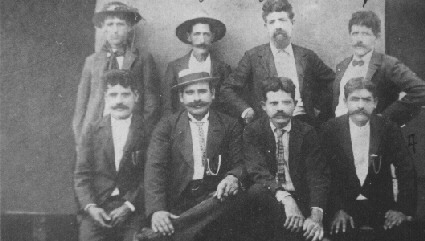 It is the only photograph with all the Pacheco brothers together. It was taken around 1905 on Kauai, Hawaii. I don’t know the specific reason they got dressed up in their finest and went to a studio to get their portraits taken. For all I know there was a special discount that week for sugar plantation laborers. I have a feeling it had more to do with the fact that with two of the brothers showing signs of illness and others talking of leaving for California, they may have anticipated they wouldn’t be together for very long. Theodoro left Hawaii in 1906-1907 because he had leprosy and was escaping deportation to Molokai. Joao was diagnosed with tuberculosis sometime around when this was taken. He died in 1906 from the disease. It is a snap shot in time. A moment when they were still together before illness, immigration, and family disputes separated them for good. A while back I split the photo up for collages. It helped me take a better look at the brothers. Here they are in order by age: Antonio, Manoel, Jose, Joao, Francisco, and Theodoro. Do you see the resemblance? I assume this was my great grandfather’s copy. He must have brought it with him on the ship from Hawaii. Then when he died in 1914, my great grandmother held on to it. It passed from her to her daughter, Maria, probably when she went to live with her around 1930. At some point Maria gave it to her son, Ted. Ted still has the originals and I’ve made sure I’ve shared my copy with as many cousins as possible. In this way, we can make sure that these men are not forgotten. It is important to preserve photographs. If you have the only copy, make sure you digitize it, print it, and share it. Too often we lose these images because only one copy existed. Think how remote Kuaui was in 1905! It’s still remote today. Before my father, Alfred Arthur,died he had begun to research his Pacheco family tree? His legal name was as stated above, but he was always went byArt or Arthur or A.A. Couldn’t sleep, so decided to go through his collection of family tree papers and Antone Algrave Pacheco aka Anthony Algravia was my Great grandfather. One packet item was the photograph of the Pacheco brothers that I stumbled upon when I researched Anthony Algravia Pacheco. The very same photo that you have posted! His son, my grandfather, was Manuel and as stated arthur was my dad and my uncle was Anthony. Fromdad’s researchresearch, he was never able to locate how Antone (What ship)made his way to Hawaii. So excited to have made a connection! Nancy, You are the first person I know who has the photo of the Pacheco brothers. I am happy to know there are more copies. We are definitely cousins. I will send you an email about the Pacheco. Thanks for your comments!